Just footsteps from the ocean on the Southeast Bali coast, Villa Majapahit Raj is your tropical garden oasis, home away from home. Views of the ocean, sounds of the pounding surf, a shimmering pool framed by a lush green garden, and luxurious modern appointments await you at this deluxe accommodation. It’s a destination built for relaxation, leaving you enthralled at its simple opulence and spectacular ambience. 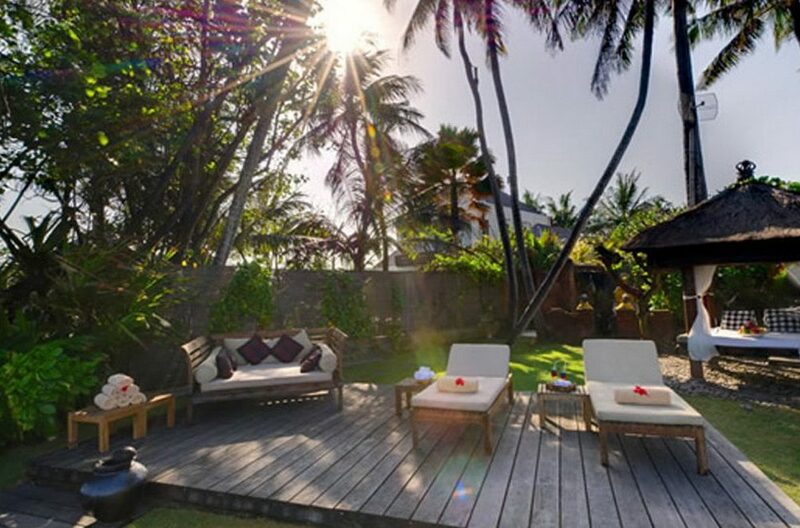 Three spacious bedrooms designed with island flair, indoor jacuzzis that flow into a twelve meter outdoor pool, and a private garden area with massage and relaxation pavilions will entice and delight you. Easy access to the ocean, and lots of space for lounging, create an environment conducive to excessively relaxing vibes. 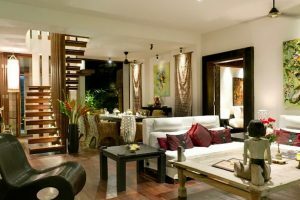 The villa is family friendly, and ideal for a family vacation or group trip; or rent the two associated villas along with Villa Majapahit Raj for big events like destination weddings. You’ll find the friendly confines of Villa Raj located a stone’s throw from the volcanic black sand of Pabean Beach. A relaxing pocket of loveliness on the Southeastern coast of Bali, this untouched wonder will inspire you with its beauty and serenity. Unbeatable service from our excellent staff manifests in your holiday as soothing massages, delicious meals from a private chef, and all your needs being handled by a personal butler. Scenic, relaxing, and an ideal place from which to explore Bali, you will find your own fantasy island at Villa Majapahit Raj. The second floor master suite is regally appointed with a king size bed with modern frame, a great location for a quick catnap. Engraved doors of local wood are the spectacular entrance to the guest bedrooms on opposite sides of the living area. A plush king-sized bed with modern frame is ready for a restful night’s slumber in each room. Cold air-conditioning comes with all bedrooms, or open the glass doors to take the tropical garden experience during daytime hours. Gorgeous views of the pool and gardens, along with ocean glimpses and a soothing waves soundtrack, are yours from the connected upstairs balcony. Hop out of bed and into the pool, or take a morning stroll down to the beach, through the downstairs guest bedroom glass doors. When you want to wind down at night with a little entertainment, there are flat screen TV’s with satellite channels. 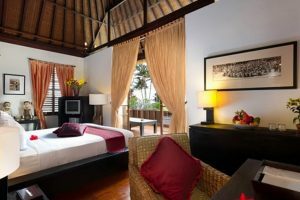 The design and decor of the bedrooms includes framed photos highlighting Bali heritage counterpointed with modern dark wood furnishings, creating a calming ambience that will leave you asking for breakfast in bed. The master and two guest bedrooms come complete with delightful ensuite bathrooms. Ornate wood privacy screens separate two attractive areas in the master bath, where you’ll find a soaking tub, rainfall shower, and wash basin on one side, and a toilet and wash basin on the other. The guest bedroom baths are visions in black concrete, and are semi-open air with tropical plants and partially open roofs. Sunken tubs are perfect for relaxing evening soaks, or enjoy a steamy rainfall shower instead. 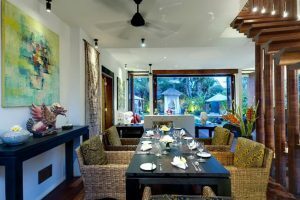 The detailed, tasteful decor includes high ceilings lined with bamboo and wood, along with all the necessities needed for your comfort and cleanliness. 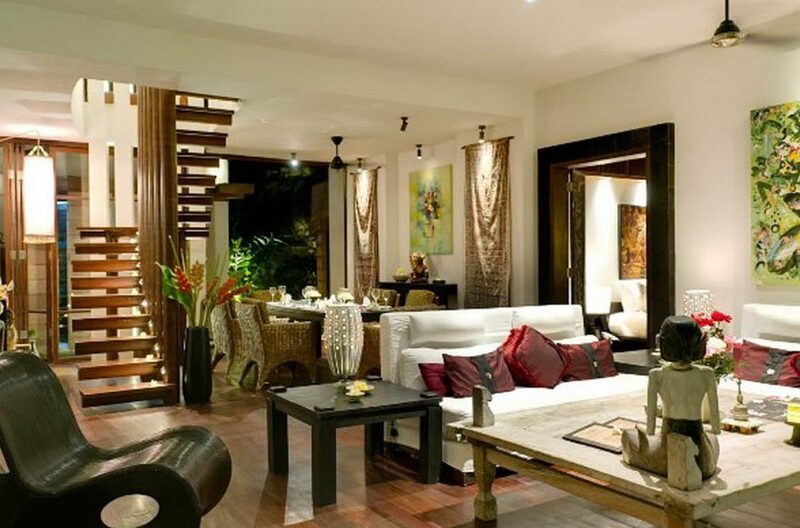 Villa Raj’s spacious living area is where the indoors meets the outdoors. The fan-cooled area not only faces the pool, but you can literally go from the couch to the water. 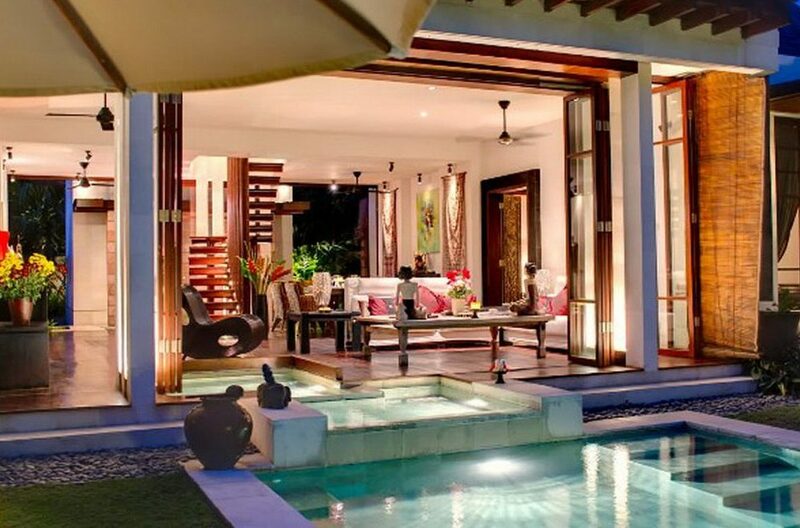 An aquatic entrance to the pool and jacuzzi extends into the living area, behind large glass doors. Open the doors and let the ocean breezes circulate while you and your guests converse in the well-furnished seating area on comfy sofas, or perhap gather for movie night around the flat screen satellite TV. When it’s time to dine, a koi pond frames a formal dining table for six, sure to provoke lots of conversation and more than a few fish stories. A fully stocked, modern kitchen stands at the ready whether your appetites run to setting up a breakfast omelet bar or a whipping up a delicious late night snack. Leave the cooking to others and enjoy your holiday by having the Villa Raj private chef prepare and serve savory gourmet meals at any time of the day. Inside your lush personal garden, take a few lazy backstroke laps in the azure 12-meter pool, then work on your tan or a good book in a poolside lounge chair. 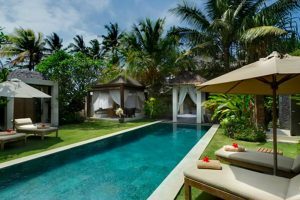 A private massage pavilion is an ideal location for a deep tissue Balinese massage; ask your hospitable villa manager to set it up and then melt into a puddle of bliss. 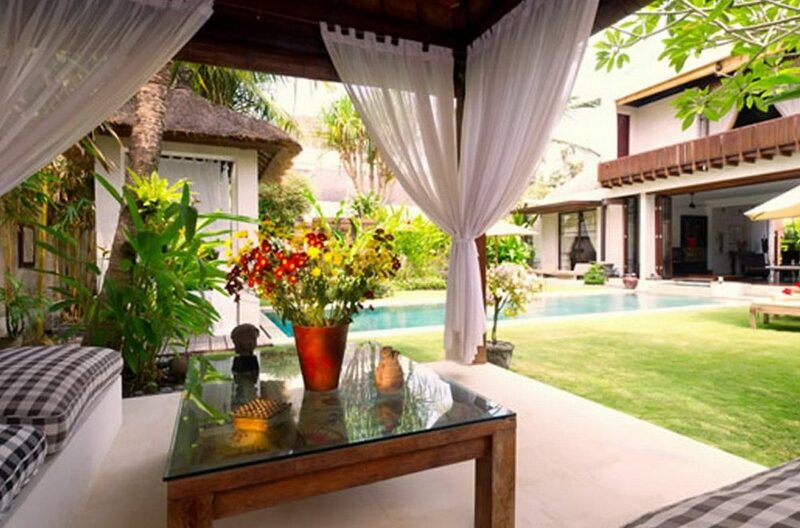 Have evening drinks and all-day lounging in the garden’s large relaxation gazebo, furnished with comfortable couches. 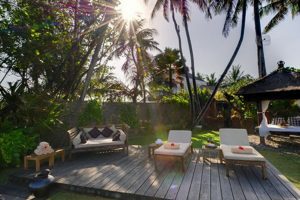 Wander down the walled pathway to the black sand beach for ocean swimming or sunset watching from the shared timber deck and thatched-roof bale. 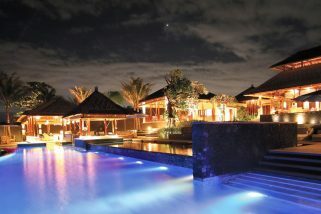 If you haven’t had enough relaxation already, soak in one of the jacuzzis as you gaze at the moon over Bali. There’s something for everyone in the great outdoors at Villa Raj. You’ll find your every need and request met by the friendly Villa Raj staff. 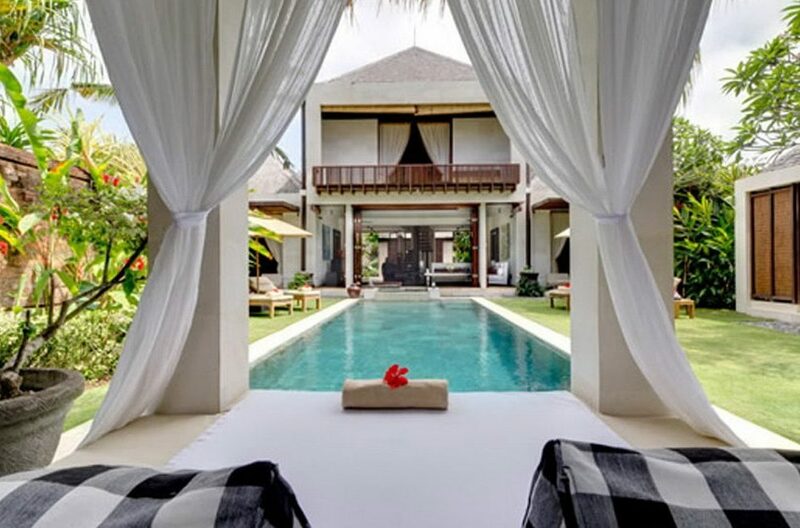 Direct all your everyday requests to your butler or to the villa manager, and you’ll experience the 5-star Balinese hospitality that Villa Raj is known for. Delicious Western and Japanese cooking styles are specialties of the villa’s chef, so have your meals cooked and served while you enjoy the holiday. On-site spa services are readily available for professionally trained staff, whether you need a massage or a facial. Included services encompass housekeeping, gardening, pool service, and 24-hour security. Your stay with us will be easy and worry-free. Villa Raj is one of three villas in the Majapahit Beach Villas enclave. The location couldn’t be better for a beach holiday – right on the sand at Pabean Beach. On the southeast coast of Bali, this quiet stretch of sand has the beautiful views and tropical island serenity that make it postcard picture perfect. Bordered by rice fields, fruit plantations, and local villages, this is the real Bali, unfiltered. Easy walks lead you to local restaurants serving real Balinese and Indonesian meals, a great way to meet the local people and experience their culture. Villa Raj is also located in an ideal jumping off point for seeing the rest of Bali. 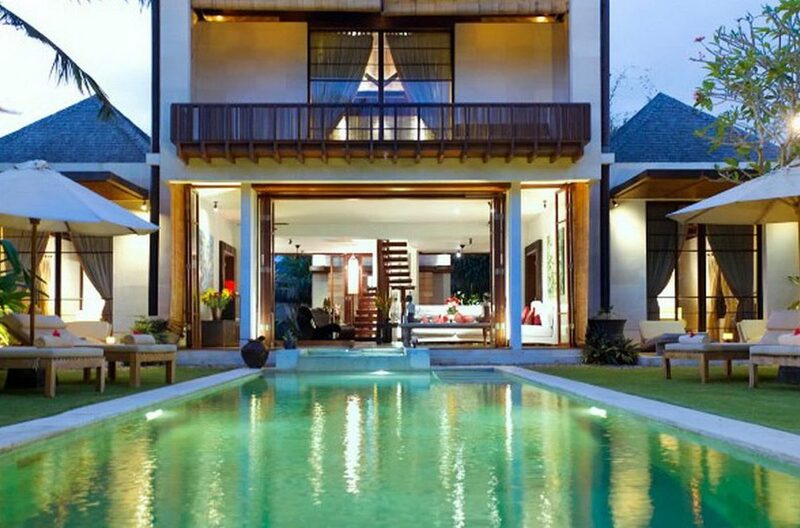 If you are interested in shopping, nightlife, or top shelf restaurants, the towns of Seminyak and Canggu are but a short drive away. If your interests fall to arts and crafts, or perhaps yoga, the cultural heart of the island, Ubud, is within striking distance as well. 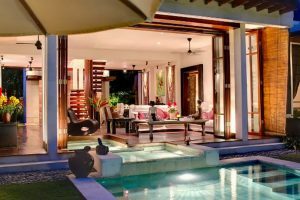 Island tours, transportation, and information about all the must-see local attractions can be obtained by checking with your ever-helpful villa manager. Whatever Bali experience you desire in our paradise oasis, we’ll go out of our way to make it happen when you stay with us at Villa Raj. Situated within the Anapuri Villa Estate, Villa Puri Salila being the largest, provides substantial accomodation with six king-size bedrooms. 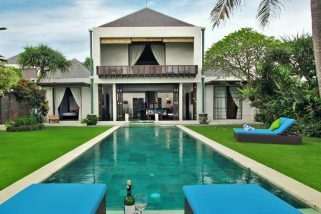 The villa features modern amenities and entertainment facilities to cater for large families or groups of friends looking a taste of the high life. 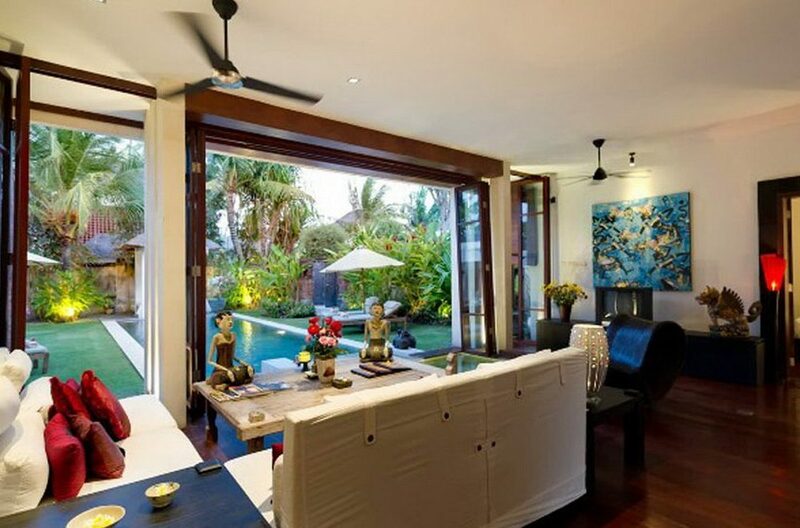 Located in the lush tropical seaside village of Sanur on Bali’s south eastern coast, Villa Casis provides ample accomodation for large families and groups of friends.